Gandhinagar: The last living space of the remaining 523 Asiatic Lions is under threat ! Over 57 hectares of forest area inside Gujarat’s Gir Wildlife Sanctuary is under encroachment, the state government informed the Legislative Assembly, says a PTI report. Of these, 1.31 hectares had ‘religious structures’ on them. While responding to a written query raised by Congress MLA Mohanlal Vala during the Question Hour, state Forest Minister Ganpat Vasava said that a total of 57.53 hectares of land inside the Gir Sanctuary was under encroachment. 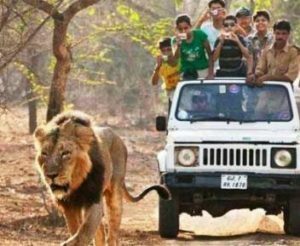 Vasava informed that there was no encroachment in the Gir National Park situated inside the sanctuary. Out of the 57.53 hectares under encroachment, 56.17 hectares was being used for farming by locals while 1.36 hectares had religious structures on them, Vasava’s written reply stated. He informed the House that while some land had been encroached long back, others were illegally occupied after 1987-88. He said that the state had taken various steps to clear the encroachments but several occupants had filed court cases against such government action. As per the Census of 2015, there are 523 lions in and around the Gir Sanctuary, the last abode of Asiatic lion.